Mrs. Matilda Cynthia (Cathia) Goddard Boston was called home to be with Our Lord on the afternoon of September 17, 2018 after a brief battle with an illness for 6 months. She defied the odds, but God saw that her load was getting harder to carry and He called her to eternal rest. She was born to the late Lydia Biggs Goddard and Tom Goddard on September 20, 1920. She was one of seven children born to this union. She was educated in the Martin County School System in North Carolina and proudly exclaimed that after she graduated she got married the very next day. To this union were born eleven children of which she was preceded in death by five. She worked on the farm for most her life and later worked with the Southeastern Tobacco Company from which she retired in 1985. She enjoyed spending time with her family, cooking, traveling, canning, and sharing stories of her childhood. She mesmerized us all with these great stories. 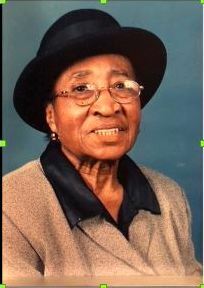 She was noted for her great cucumber pickles, chicken pot pie, sweet potato pies, and mouth watering fried chicken. She was preceded in death by her husband, William Luke Boston, Sr., after 29 years of marriage. She was also preceded in death by sons: William Jr., Tommy, and Robert; daughters: Norma and Lillie, all of her brothers and sisters along with all of her husband’s brothers and sisters and their spouses. She leaves to cherish her memory: 3 daughters: Leda Faye Boston Bryant, Patricia Ann Boston Gaye, and Shelby Jean Boston Peele(Todd); 3 sons: Rev. Edward(Deborah)Boston, MD, FACOG, Pastor New Bethel Baptist Church, Yorktown, Virginia, Pastor Phillip Boston of New Orleans, Louisiana, Michael(Dana) Boston, Gainsville, Virginia; One daughter in law: Shirley Boston of Virginia Beach, Virginia; 28 grandchildren, 53 great grand children, and 37 great great grand children. She also leaves to mourn one sister in law, Gertrude Council Godard along with a host of cousins, nieces, nephews, and friends. She also leaves to mourn her, her beloved Smithwick Chapel Disciples of Christ Church family. She made an indeliable impression on all. She will be sorely missed. We loved her but God loved her best and called her to possess her mansion which was completed and ready for immediate occupancy on September 17, 2018. The funeral service will be held Saturday, September 22, 2018 at St. John Church of Christ, DOC 2283 St. John Church Road in Washington. Viewing will be held from 10:00 am to 11:00 am before the service at the church. Burial will follow the service at Everett’s Cemetery in Everetts. MERCEDES’ Funeral Mansion and Cremations Services of Williamston is honored to serve the Goddard and Boston Family.